The Honda Izy HRG416SK is a new 16″ (41cm) self propelled lawnmower. It features an even more powerful Honda GCV160 engine, producing 160cc and 4.4hp of net power. This new Izy mower from Honda has intuitive operation making it incredibly simple to use and maintain. The Honda Izy HRG416 SK powered by an ultra reliable Honda OHC 4-stroke GCV160 engine, which is environmentally friendly as well as powerful. The 4-stroke engine design is very economical and clean whilst the much quieter blade design gives the Izy HRG 416 SK a 30% noise reduction. 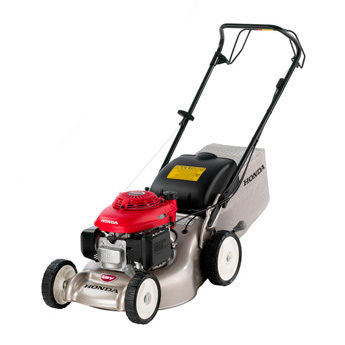 The Honda HRG 416 SK lawn mower has great safety functions such as the blade brake function. When letting go of the handle it automatically stops the engine and blade providing the peace of mind needed when using a lawnmower. With its flexible, double-lined cables and auto choke system the recoil start could not be easier. The auto choke system ensures a perfect start in any weather conditions. The steel cutter deck is incredibly robust with great durability. It has a rounded design which provides optimal airflow for outstanding grass collection as well as incredibly easy cleaning for no hidden areas for grass to stick to. It also features folding handles which makes storage much easier. The 50 litre grass bag means less trips to empty as you mow. It has a intuitive slot-in/slot-out design which is perfectly balanced for easy handling, and the built-in rear shield drops down to protect your legs when the bag is removed. With six cutting positions between 20 to 74 mm, it gives you plenty of option when choosing your ideal grass finish.